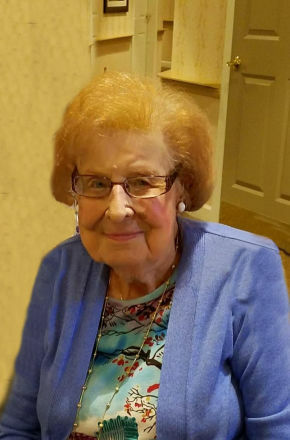 Jean (Sasiela) Hrasdzira, age 99, of Glen Rock, NJ passed away on Wednesday, January 16, 2019. Born in Passaic, NJ and raised in Garfield, she resided in Glen Rock for 65 years. She was a parishioner of St. Catharine R.C. Church in Glen Rock. Active in her community, she was a member of the Bergen County Republican Committee, AMVETS Post 13 Ladies Auxiliary in Garfield and American Legion Post 145 Ladies Auxiliary of Glen Rock. Jean enjoyed sewing and was a loyal NY Yankees, NY Giants and NY Jets fan. Prior to retiring, she was a seamstress with Passaic Boys Suit Company in Passaic for many years. Beloved wife of the late Rudolph Hrasdzira. Loving and devoted mother of Kenneth R. Hrasdzira and wife Olivia. Cherished grandmother of Sandy Atkins and husband Neal. Dear great-grandmother of Liam and Rory. A Mass of Christian Burial will be celebrated Saturday, January 19, 2019, 9:45 am at St. Catharine R.C. Church, 905 South Maple Avenue, Glen Rock, NJ. Entombment will follow at St. Mary’s Cemetery in Saddle Brook. In lieu of flowers, donations in memory of Jean to The Valley Hospital Foundation (please write “restricted to Valley Hospice” in the memo of the check), 223 North Van Dien Avenue, Ridgewood, NJ 07450 or the Glen Rock Volunteer Ambulance Corps, 700 South Maple Avenue, Glen Rock, NJ 07452 would be appreciated.